Your IFR aircraft has a TSO GPS receiver and ADS-B transponder. Your instrument rating and charts are up to date and you believe you’re ready to tackle an LNAV/VNAV approach, also known as baro-VNAV. But are you? Labels can be confusing. Just because your GPS says it’s baro-VNAV capable doesn’t mean you’re ready to entrust your safety and those of your passengers to your GPS receiver. the right aerodrome and runway operating conditions. LNAV refers to lateral (2D) guidance for a GNSS non-precision approach. An LNAV GNSS approach will get an IFR pilot on the correct path, but the pilot must ensure that the aircraft is at the correct altitude at each fix. The aircraft must not descend below the minimum descent altitude (MDA) unless visual. Some GNSS receivers (particularly Garmin models) are capable of displaying an advisory vertical profile. This is sometimes known as LNAV+V, and there are important difference between this and baro-VNAV. With LNAV+V, the vertical component is generated by the receiver itself, rather than from a properly coded and validated underlying RNP APCH (RNAV GNSS) approved instrument approach procedure. The pilot must still respect stepdown fixes throughout the approach, and must also not descend below the LNAV MDA unless visual. 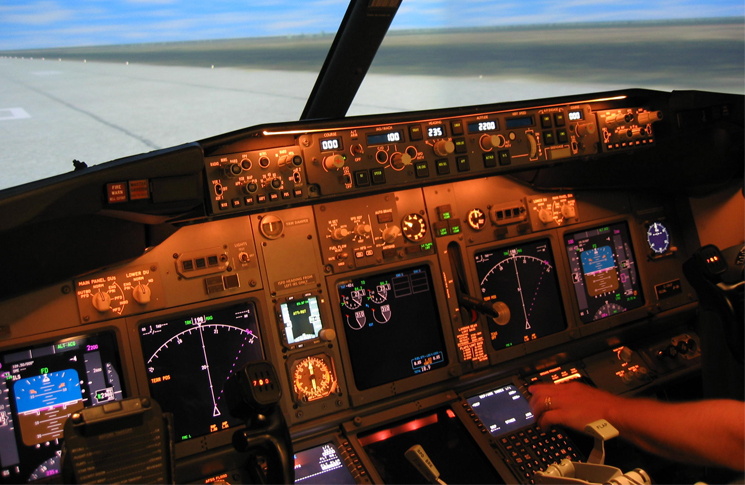 Approaches with vertical guidance (3D approaches) offer a smooth and stabilised descent. They improve situational awareness and reduce workload. In Australia, baro-VNAV is being rolled out in line with ICAO recommendations to establish safer approaches to landing. Baro-VNAV relies on highly accurate altimeter readings, which take account (among other things) both the aerodrome local QNH and temperature. Its use is also restricted to runways with a validated promulgated LNAV/VNAV RNP APCH instrument approach procedure. The use of baro-VNAV also requires avionics including an air data computer—typically a certified flight management system (FMS) or other suitably certified area navigation system capable of computing barometric VNAV paths and showing relevant vertical deviations (within a range of plus or minus 75 feet) on the cockpit instrument navigation displays. The addition of vertical guidance through baro-VNAV does not necessarily improve the landing minimums for a particular approach. However, in many cases, the landing minimums (i.e. the decision altitude, or DA, in the case of a baro-VNAV approach) is lower than that for a runway aligned LNAV approach (the MDA) at the same location. 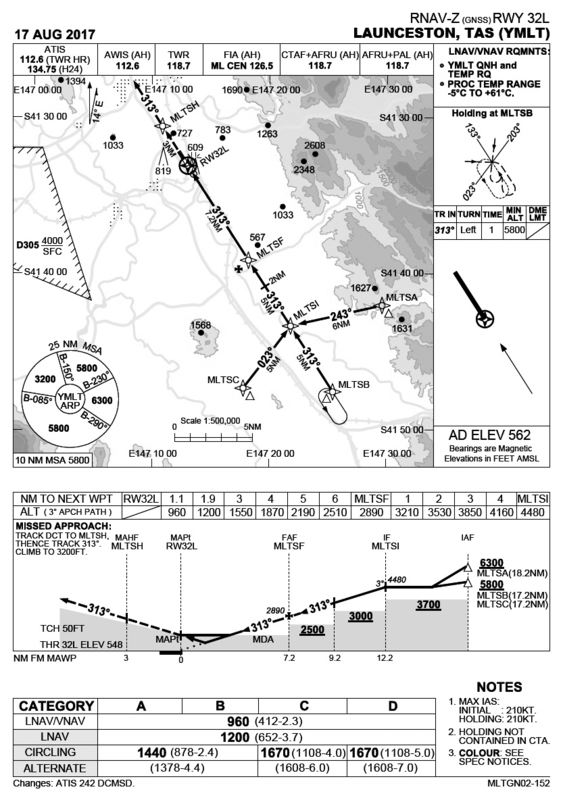 For the RNAV GNSS RWY 32L approach at Launceston, for example, the baro-VNAV (LNAV/VNAV) DA is 960 ft; without vertical guidance (LNAV only) there is a MDA of 1200 ft. See the chart below. In some cases, there will be separate charts for LNAV-only (2D) and LNAV/VNAV (3D) approaches. Typically, this will be because obstacle clearance requires a different flight path and missed approach point (MAPt) for the two approaches. the aerodrome needs to have accurate aerodrome QNH and temperature available through either an aerodrome air traffic service, an aerodrome weather information services (AWIS) or automatic terminal information services (ATIS). The Airservices Australia website lists aerodromes at which baro-VNAV approaches have been approved, validated or are planned. It also shows locations at which baro-VNAV approaches cannot be made, because the aerodrome has an unsuitable approach alignment, has been deregistered or has no local QNH or temperature available. Where a baro-VNAV approach is available, the RNAV GNSS chart will specify that the aerodrome QNH and temperature are required, and the temperature range under which the procedure can be flown. For the RNAV GNSS RWY 32L approach at Launceston, for example, the temperature range is minus 5 to plus 61 degrees Celsius. The actual path flown by the aircraft will depend on the ambient air density. A temperature higher than ISA will result in a steeper approach path; conversely temperatures lower than ISA will result in a lower descent profile. Where temperature and aerodrome QNH are temporarily unavailable, the LNAV-only approach must be used. So when it comes to GNSS approaches—don’t ‘push your own baro’. If you want vertical guidance, make sure you are properly equipped, trained and that the approach is approved for where you’re going.